$3629 RAISED FROM THE RACE WEEKEND! 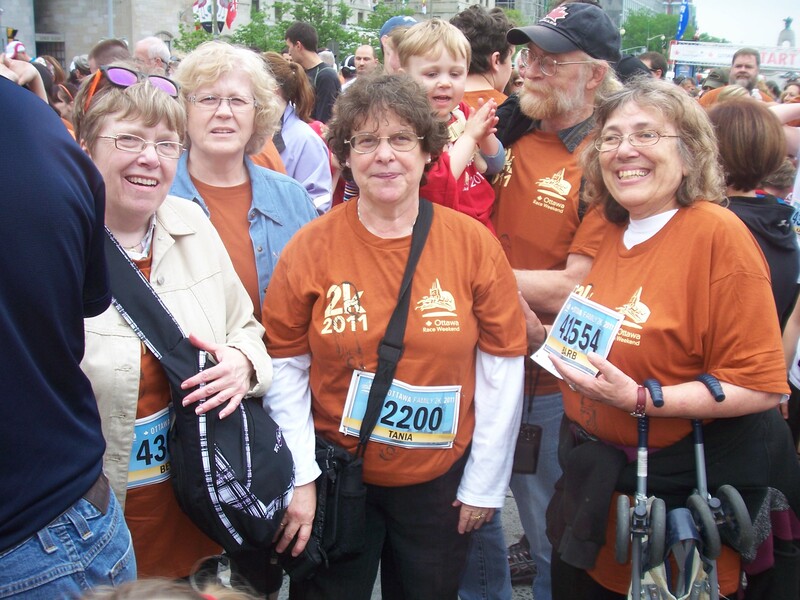 One of the most important events members of OAPWS participate in to raise money for the Marie Poulos Fund is Ottawa’s Annual Race Weekend held at the end of May. This fund enables individuals to attend intensive and semi intensive programs at Ottawa’s Stuttering Treatment Clinic. OAPWS members were part of the Stuttering Treatment Clinic Team and we were among the 40,000 individuals who took part in various race events on May 28th & 29th. Some ran, some walked. 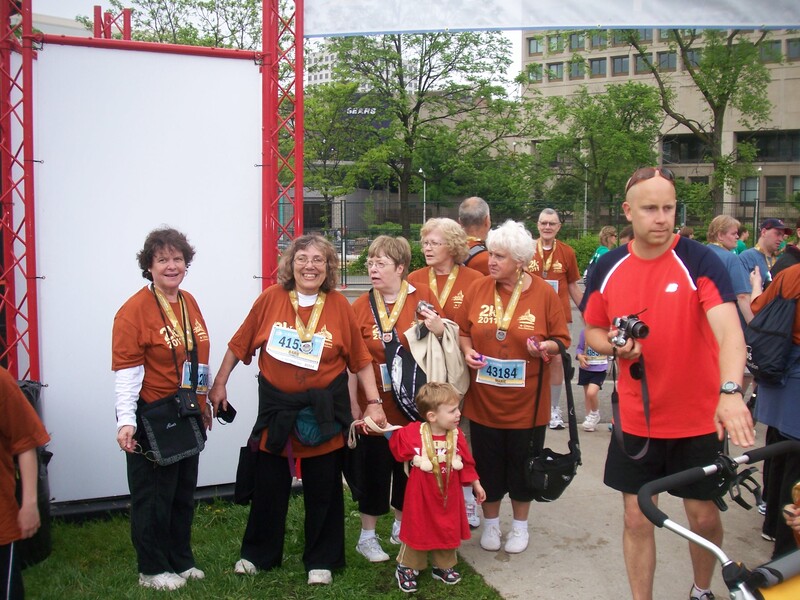 The oldest participant on our team was 63 who managed to run the 5K without having a heart attack while others entered various events such as the Family 2K. Among the 2K enthusiasts was our youngest team member Connor who is only 2 & ½. This year our Team was captained by Kara Beck the Clinic’s Coordinator. In addition to Kara we want to recognize other team members including Beverly Barclay, Julianne Labreche, Amanda Skinn, Mark and Barb Smith, Stephanie Corbett, Colleen Bellefeuille, Joshua Manser, Connor Smith-Holt, Sylvie Manser, Tania Kamienski, Kathryn Helmer, Wayne Lyrette, David Burton and Marie Khorrami. We are grateful to the many friends, co-workers and family members who sponsored us and helped us raise $3629 for the Marie Poulos Bursary Fund. All of you made this event such a success. Next year we intend to raise even more money by obtaining business and corporate sponsors and by encouraging more individuals to join the team in ‘running for a reason” that reason being to help people who stutter. 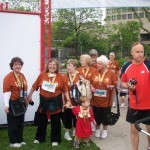 In fact, our team’s participation in the Race Weekend was part of the Ottawa Hospital Foundation’s “Run For a Reason” Campaign. At the end of June the Foundation sponsored a special thank you event for members of all the teams participating under the OHF banner. This year teams raised $631,345 events for various departments and services of the hospital. Many of our team members attended this event and we are proud of what we accomplished. Why not start considering joining us next May in running/walking for this important cause? Registration for the 2012 Race Weekend opens on September 1, 2012. Too early to think that far ahead? Consider that in 2011 by the end of February many of the race events were already filled. If you are a runner and want something to train for consider becoming a member of our team. If you have never participated in the Race Weekend you will discover it is a wonderful, fun filled and rewarding experience no matter what event you participate in on whatever level. And remember, the Race Weekend is not just for runners. People jog slowly, walk and many enter the wheelchair races. There is even a half marathon just for kids. The Family 2K is especially a wonderful event that children and adults of all ages love. Why not make it a family affair and join OAPWS? There are other ways you can join us. Maybe you like fundraising and have great ideas on how to solicit sponsors. Perhaps you have some business connections and can help us obtain corporate sponsors. We can use your expertise and enthusiasm. And remember our goal is not just to raise money. It is to raise awareness about stuttering and about the challenges faced by people who stutter. And to enable individuals who could benefit from speech therapy get the necessary treatment they deserve. If you want to know more about our participation in this year’s Race weekend or how you can become involved next year contact David at david.burton2@rogers.com.